How does solar energy work ? How to check the quality of a Solar Panel ? Energy Autonomy : how does it works ? How wind energy works ? How Do Plug-In Electric Cars Work? 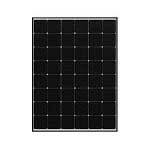 heliosolaire offers you the complete range of Sharp solar panl. For more than 50 years, Sharp Corporation has offered a range of solar modules for a wide range of applications, including industrial buildings, residences, offices and power plants with the highest yields and quality. The manufacturers decided to extend their range of photovoltaic panels with four monocrystalline silicon models assembled in Germany: a 300 W model with a silver-colored frame (NU-RC300) and three all-black models from 290 to 300 W (NU -RD290, NU-RD295 and NU-RD300). The power of Sharp polycrystalline photovoltaic panels ranges from 265 Wp to 270 Wp. Photovoltaic panels are also well-suited for applications connected to the network as well as for applications on isolated sites. Depending on the installation location of the solar modules, the solar modules can be exposed to particular environmental influences and must therefore be very resistant. Sharp solar panels use high-quality components, approved for harsh environmental conditions, for production. Solar manufacturers specify two different warranties: the product warranty and the performance warranty. The output of a solar module naturally decreases with time. The maximum reduction is regulated by the guarantee of performance. Sharp offers a 10-year warranty on the product, and 25-year warranty on linear performance. Some manufacturers specify a level performance guarantee. With Sharp’s linear performance warranty, you can safely plan your solar power plant. NQR256A-Mono-SHARP.pdf The latest-generation monocrystalline SHARP NQR-256A photovoltaic panels have outstanding yields of 19.8%. The back contact innovation system provides maximum efficiency and reliability by improving the efficiency of solar radiation conversion by placing the contacts at the back of the cell. Its compact size with these 48 cells and its weight allow easy handling on the roof. 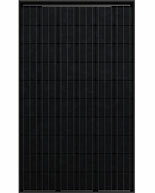 The Japanese manufacturer Sharp also won the “Good Design Award” for its solar panel back contact. This award, presented since 1957 by the Japan Institute for Design Promotion, recognizes outstanding designs and is Asia’s largest design award. NURC300W-Mono-SHARP.pdf The last-generation monocrystalline SHARP NURC-300 photovoltaic panels have yields of 18.3%. Designed for residential or commercial projects, the SHARP solar panel offers exceptional quality of durability (PID test). The last-generation monocrystalline SHARP NURJ-280-285 photovoltaic panels have yields of 17.4%. Designed for residential or commercial projects, the SHARP solar panel offers exceptional durability with successful ammonia and salt spray tests. NURD285-300W-Mono-SHARP.pdf The latest-generation monocrystalline SHARP NURD-285-290-295-300 photovoltaic panels have yields of 18.3%. Designed for residential or commercial projects, the SHARP solar panel offers exceptional quality of durability (PID test). 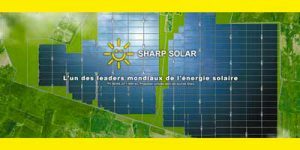 NDAH315-320W-Poly-SHARP.pdf The SHARP NDAH-315-320 polycrystalline photovoltaic panels equipped with 72 latest-generation cells have a yield of 16.5%. Designed for residential or commercial projects, the SHARP solar panel offers exceptional quality of durability (PID test). NDRJ260-270W-Poly-SHARP.pdf The latest-generation monocrystalline SHARP NDRJ-260-270-275 photovoltaic panels have yields of 16.5%. Designed for residential or commercial projects, the SHARP solar panel offers exceptional quality of durability (PID test).